There is certainly a lot of improvement to be seen at Doğanköy Church following the restoration work which has been continuing steadily by the Doğanköy Community Association, there is now electric to the church and new doors, all made possible by donations from the various events being held. 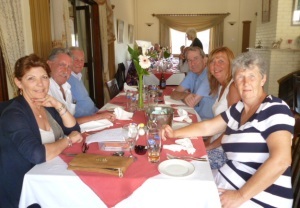 On Wednesday 16th April, a pre-Easter lunch was organised at Al Shaheen in Karakum and 60 people arrived to enjoy a splendid lunch and an afternoon of conversation with old and new acquaintances. 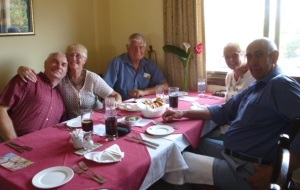 It is always nice to catch up with people you don’t see regularly. 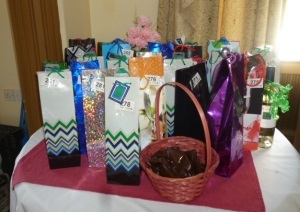 There was a raffle with a huge amount of prizes, all carefully disguised so you could win a nice bottle of bubbly or wine or maybe a bottle of shampoo or conditioner. A contribution was made by Al Shaheen and at the end of the afternoon we were told the amount of 1,100TL had been raised, a very good result. The committee are arranging a Craft Fair at the church on 11th May between 11am and 3pm so this will be a very nice event t o attend with many bargains to be had. A note for the diary perhaps. It is so important to support these events to ensure that this piece of heritage – Doğanköy Church, can be maintained for future generations and the money raised is well used for this purpose. If you require any information or would like to hire the church for an event please contact Paula on 0533 830 3256 or Incilay on 0533 864 6260. This entry was posted in Special Events and tagged Al Shaheen Karakum, Dogankoy Church Fundraiser, Dogankoy Church pre Easter Lunch, Entertainment, North Cyprus by kyreniacatkin. Bookmark the permalink.